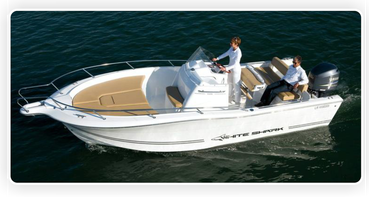 The all new White Shark 206 is a spacious 20ft day boat, featuring White Shark's renowned deep Vee hull with flared bow, deep cockpit and great handling. Very convenient center console storage unit with space for chemical WC, convertible forward seating area with picnic table that converts to large sun-pad. The new White Shark 226CC offers big boat feel in a manageable 22.6ft size, the deep cockpit and high freeboard coupled with a large flared bow ensures a smooth and safe dry ride even in the roughest conditions. 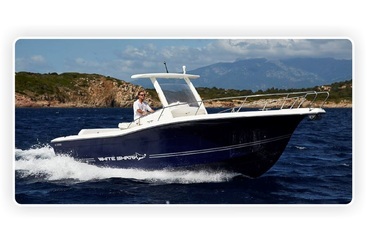 White Shark 246 CC offers considerable offshore sea keeping capabilities. With power options up to 400HP on a twin engine installation she's also capable of serious performance even in the harshest of conditions. 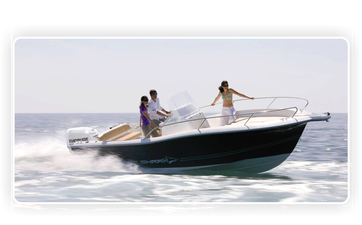 The high console and plexiglass screen ensures good protection at the helm, robust build quality with deep Vee and large flared bow ensures those on-board a safe dry ride. 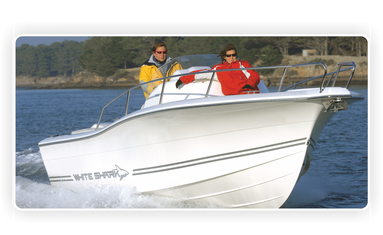 White Shark 270CC is the latest incarnation of White Sharks superb range of open, offshore family sports boats. In addition to bow seating for 6 with infill sundeck and picnic table she features central aft forward and aft facing seats, offering a large sociable area with extendable dining table, that converts into sundeck. Port and starboard transom gates. Helm leaning post with optional sink, fridge and cooking stove. Center console cabin housing marine toilet, changing facilities and further optional galley station. 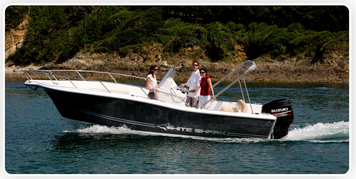 Based on the formidable hull design with deep V, rising sheerline and flared bow that gives these boats the performance of a high speed RIB with the benefits of a hard boat (increased deck space, high freeboard and deep cockpit). Serious 30ft offshore Center Console performance boat, with power rating up to twin 350HP V8 outboards this is a very fast and capable boat in even the harshest of conditions. Twin cabins sleeps 4, separate heads, full galley, large open foredeck with picnic table seating for 6, converts to sundeck. Spacious 23ft family weekender with cuddy cabin featuring freshwater sink, stove and space for chemical WC, cabin sleeps two. Forward sundeck accessed from walk around steps ,high bow rails. Deep cockpit with comfortable seating for 4 plus optional picnic table, bimini shade and full fishing pack. The largest shark in the range, featuring spacious accommodation below decks with sleeping for two + with galley, separate heads compartment and saloon with dining table. Externally, sundeck forward with high bow rails. Huge aft deck with seating for 6, picnic table, bimini shade, transom shower, optional fishing pack or water-sports rig. 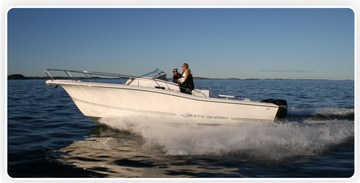 Power up to 700HP via twin 350HP outboards.